The first step to use our online bookmark manager is to Sign Up. Signing Up is a one-time activity. Once you sign up, you will have a personal account, including a private storage for your bookmarks. Click on any Sign Up link to open a dialog shown on the picture. Language - choose a language. SiteBar will switch to the selected language. Language selection can be changed also anytime later in the User Settings. Username - your user name, you will use it for logging to SiteBar and your bookmark tree will use this name. Password - enter a password for your account. Repeat Password - repeat the password to avoid typos. E-mail - an optional field, however providing an e-mail address is recommended; it is useful, especially in case you forget your password and request its reset. Press button [Submit]. You might want to check our Terms of Service before you do so. You can also click on Show Advanced Controls to extend the dialog as shown on the picture below. You will be logged in. We do our best to keep users satisfied. Please let us anytime know how to improve our service! Verify E-mail - an optional field, when checked the system sends you a verification email. By following a link in this email your email address will get verified. Only users with verified email may qualify to join other members' groups and can use SiteBar for sending emails outside, e.g., when using function Email Link. 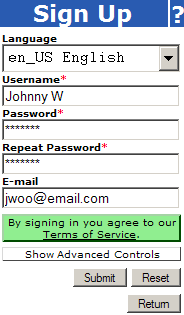 Real Name - an optional field, enter your name. Comment - an optional field, enter any comment if you want. If you need more information, you may use technical SiteBar Help or visit help forum. Questions and suggestions related to my.sitebar.org or this website send directly to the administrators. The site and services are proudly provided by SiteBar authors. SiteBar is free open source software. Copyright © 2003-2019 Ondřej Brablc, © 2004 SiteBar Team, © 2003 David Szego.